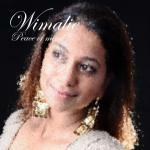 Wimalie, independent singer/songwriter from Sweden, with roots from Sri Lanka, (formerly Ceylon). Her favorite type of music ranges from Rock, R&B, Pop, Soul and Classical music. Wimalie can´t really describe her own music style, because she can't stick with one particular genre/sound. She just writes whatever comes into her mind. Lyrics are created from events that have happened in her life, and people she meets. Wimalie´s first original song "Peace of mind" was released in November 2014. This song is about being honest with yourself, and finding something that you love that feeds your true self. "Peace of mind" is Wimalie's first official release. Her latest song is called "Break the cycle" and was released in March 2015. Listen to Wimalie´s latest track "Break the cycle"